Visual and media anthropology has informed my research in many ways. In my understanding, the transitions between using media as a source of information, a tool to engender participation and a means of representation are fluid. From the start, qualitative-explorative methods have been part of my methodology. Among others, I have made use of role-playing, video documentation and public film screenings. I have applied them in conjunction with standard anthropological methods and with the aim to generate additional insight to specific research questions. These methods include a strong participatory element, which I believe is one of their particular strengths. Giving the opportunity to our collaborators to express their views and experiences in various ways, to bring to the fore the subjects they consider relevant, and to actively intervene in our research, may produce surprising and illuminating insights. Moreover, it renders the research a shared enterprise, from which both sides - the researcher and the researched - may derive pleasure and knowledge. 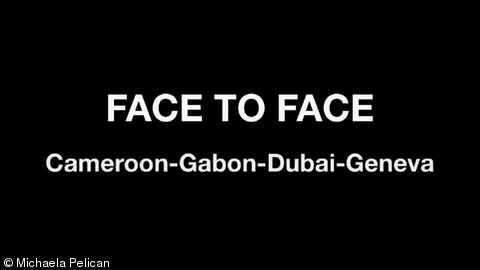 When researching transnational relations of Cameroonian migrants, I adopted a somewhat interventionist approach by proposing the exchange of video messages between migrants and their relatives back home. Many welcomed the idea and spoke to the camera to inform the addressee about the latest happenings and to express their encouragement or concern. Trailing the migrants' paths, I brought to them the message from home, and in exchange carried back their stories. For many migrants, being part of two worlds – two different realms of experience and practice – can have a highly alienating effect. By way of experiencing both worlds and mediating the communication between them, I have gained an idea of the asymmetries and misconceptions that challenge their relationship as well as of the imaginative capacity and mutual trust that are required to make these long-distance negotiations work. 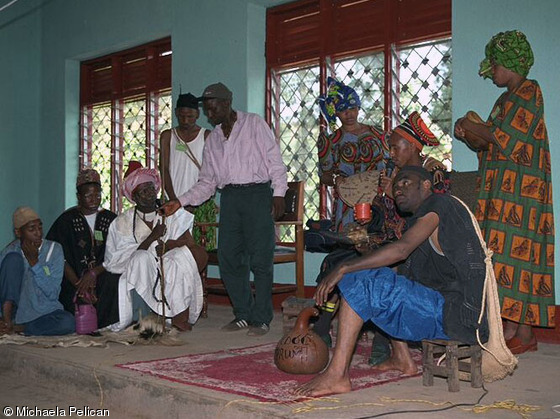 In my research on interethnic relations and identity politics in northwest Cameroon, I used the video-camera to document cultural activities and public events. Eight months into the research, my local collaborators and I organised a public screening of a cross-section of the edited footage. This screening was extremely well received. Besides entertaining the audience, it helped to render comprehensible the objectives of my research and to attract the interest and participation of many more interlocutors. Pelican Michaela and Jonathan Ngeh. 2001. Report: Misaje Film Festival 26-28th October 2001. 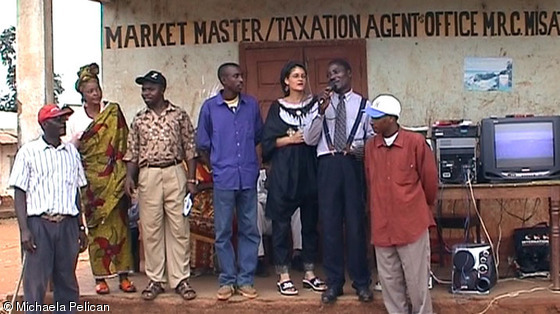 In the 1990s and 2000s Theatre for Development became a popular tool used by non-governmental organisations operating in northwest Cameroon. As their work partly coincided with my research, I decided to benefit from their theatre activities and the population's familiarity with role-playing. In the course of fourteen months, I witnessed and partly participated in fifteen role-plays performed by members of local women's groups, youth groups, a regional non-governmental organisation and an informal drama group of which I was a founding member. These role-plays covered an array of topics, ranging from marital issues to interethnic tension, the benefits of Islamic education, the opposition of 'traditional' beliefs and Western education, and the conundrum of anthropological research. Some of the plays were videotaped, edited, and later screened during the Misaje Film Festival. Here I want to introduce two role-plays that have been particularly informative with regard to my research. One was performed by the regional non-governmental organisation Ballotiral and deals with strained relations between farmers and herders in northwest Cameroon. The second was enacted by a group of Mbororo women who reflected on their experiences of selling milk products. Both address the subjects of ethnicity and conflict, and give us an idea of how local actors deal with cultural difference and make use of play and satire to challenge cultural norms. Farmer-herder conflict, role-play of the Ballotiral staff. Sippoigo (selling milk), role-play of the Mbororo women’s group of Chako. Pelican, Michaela. 2006. Getting along in the Grassfields. Interethnic relations and identity politics in northwest Cameroon. Halle, Saale: Universitäts- und Landesbibliothek Sachsen-Anhalt. Chapter 6.4.2.1., pp. 227-241; Appendix E, pp. 536-540.
anibaara - von Stolz und Mühe, Arbeit in Afrika. Exhibition, co-organised under the supervision of Till Förster, IWALEWA-Haus, May 2000 to January 2001, Bayreuth.